Neat card interactions that were useful in the game you found them in. Re: Neat card interactions that were useful in the game you found them in. Your opponent making your Advisors draw green cards can help if you buy Grand Castle or already have Opulent Castle. It can also skip Opulent Castle. Not if you already have it (assuming "have" means it's in your hand). Edge case: you Inherited it. EDIT: nevermind, can't Inherit green cards. I hadn't thought of it before, so I was pleasantly surprised in a game where I had a Princed Conclave, that I could play a Teacher from that Conclave, and then immediately call that Teacher, since it was still the start of my turn. Just had a game with Courtier and Patrons That was pretty fun. Patrons is already a decent Courtier target with 2 types, but the Coffers bonus for Revealing it was nice. In the same game I had Lurker and Silk Merchant Which was pretty amazing. Then I had Replace to throw the Silk merchants back in the trash and gain them all over again. Ever put your +1 Action token on Baker and wished, "Man, I wish these things also gained Spoils"? But it still sounds cool. Had all four of those in a game just now. Gain Rats with Cobbler just to trash it to Cathedral for an extra card or gain Lackeys for +2 Villagers just to trash it. Was this actually good? Couldn't you just get something with Cobbler that you actually wanted and skipped the Cathedral? 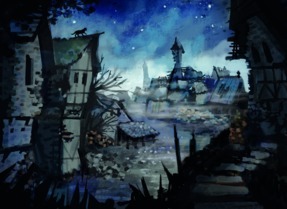 Cobbler/Cathedral + Rats alone is just a worse Ghost Town. Couldn't you just get something with Cobbler that you actually wanted and skipped the Cathedral? You probably can't skip Cathedral. It was great because Cathedral let me trash all my junk before I started doing stuff like gaining Rats with Cobbler just to trash it. Buy Tunnel, play Ghost for an immediate Gold. I feel like I'm missing something, there. How do you make sure the Ghost discards the Tunnel you just bought? By default, Ghost ends up in your discard pile. It feels like to make this work you either need Royal Seal / Watchtower / Tracker / Travelling Fair / whatever so you gain it to top of deck, or you need to have drawn your deck. But if you draw your deck before playing Ghost, you won't draw an action and you're wasting its primary effect? The way it worked was that I drew my whole deck and had Ghost in my hand. I bought Tunnel, putting it in my discard, then played Ghost, flipping the Tunnel and gaining a Gold. The Ghost didn't hit an Action, but I didn't mind because Ghost is discarded on the turn it's played if it doesn't hit anything. If your opponent has Cathedral, Pillage becomes a much meaner attack. I would in general stay away from Cathedral on Kingdoms with hand attack. OK, so what I envisaged. I can't remember what else was going on, but it seemed like a good move at the time. Impressive, but KCx2 + Bridgex3 still has this one beat. Really, it's harder to come up with things KC doesn't have a neat and potentially useful interaction with. The list of Action cards KC doesn't improve (without tokens) is a pretty short one: Library, Watchtower, Counting House, Outpost, Duplicate, Distant Lands, Tactician, Secret Chamber if we include cut cards, Madman and Wish if we include non-supply ones. True, but the inventors gain themselves which is really neat. Research/Peddler. Yeah, that's some pretty hefty card draw. Madman and Wish if we include non-supply ones. King's Court does improve those, technically, but the benefits of amassing zillions of Actions are usually rather limited. Guildhall/Capitalism. Why yes, I will take Coffers when buying these ActionTreasures, thank you. Develop really shines trashing cards in the $2-4 range and Seer lets you draw it over and over again. Scrying Pool reveals the Patrons and then draws them. Spare buys/gains? Consider gaining junk and then buying Donate (this turn or later). Feels similar to Goons or Triumph. Junkers slow your opponents down in the short term but give them points in the long term. Interesting endgame considerations: If you know the game's about to end, Donate as much of your deck as you can afford.